Department of Biosciences, Himachal Pradesh University, Shimla, 171005, India. *To whom correspondence should be addressed. E-mail: jyotika58brari@gmail.com. Received 21 January, 2017; Received in revised form 26 March, 2017; Accepted 03 April, 2017. Repellency, Fumigant toxicity, Essential oils, Stored grain, Insect pest, Cytotoxicity. The essential oils extracted by hydrodistillation from the leaves of four plants, Artemisia maritima Linn. Colebrookea oppositifolia Sm. Rabdosia rugosa Wall. ex Benth and Zanthoxylum armatum DC. were analysed by mass spectroscopy to elucidate the prime components especially monoterpenes components present in these plants. Fumigation and repellent activity of these essential oils were evaluated against the adults of four major coleopteran stored-grain insect pests, Callosobruchus analis F. (Bruchidae), Stegobium paniceum L. (Anobiidae), Tribolium castaneum Herbst (Tenebrionidae) and Sitophilus oryzae L. (Curculionide). The results obtained show that all the essential oils extracted were toxic to the adult insect pests. R. rugosa oil was highly toxic with LC50 values of 2.01, 7.21, 10.9 and 18.8 µl/mL air 24 h after treatment for C. analis, S. paniceum, S. oryzae and T. castaneum, respectively. Similarly, A. maritima was slightly less toxic with LC50 values of 3.2, 9.8, 18.5 and 23.5 µl/mL air 24 h after treatment for the same four insects, respectively. C. oppositifolia was least efficacious with high LC50 values. Maximum repellency of 90 and 88% was observed for S. paniceum at highest concentration of 10 µl/cm2 after 5 h exposure of R. rugosa and A. maritima oils. 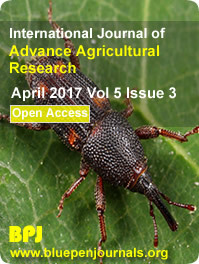 All four essential oils exhibited repellent efficacy at all concentrations, but especially after the shorter exposure times of 1, 3 and 5 h which decreased with increased exposure period of 24 h. C. analis and S. paniceum were more susceptible to all the four plant oils than other two insect species. Cytotoxicity studies revealed that essential oils showed no toxicity at low concentrations or a very weak toxicity at high concentrations towards BV2 cell line.